Michael Morn might be a villain, but that doesn’t mean he’s a bad guy. When you live in New Liberty, the City Without a Hero, you sometimes have to turn to crime to get by. Michael and his Dad do what they have to in order to survive. But then a Super named The Comet comes to town and Michael’s world is thrown into disarray. The Comet could destroy everything Michael and his dad have built. Soon Michael must decide whose side he is on, and how far he is willing to go save the people he cares for most. This coming-of-age story is a companion novel to SIDEKICKED, but is a stand-alone story. The reading level and vocabulary are ideal for grades 5 through 8. Be aware, there are moments of comic-book style violence. The novel also addresses complex issues of morality, family structure, trust, and spirituality. "If I was a supervillain, my name would be the Influencer or Mr. Manipulative or Dr. Suggestive--though I guess that last one's got more of a late-night cable television ring to it. I would wear an all-black bodysuit with a picture of a skull on the front, except instead of eye sockets there would be those little swirlies that hypnotists and magicians use, the ones that seem to spin forever like a bathtub that won't stop draining. And would also have rocket boots, because why not." John David Anderson returns to the world he created in Sidekicked with an entirely new cast of characters-this time the villains-in a funny and emotional companion to his first breakout tween novel. Michael Morn might be a villain, but he's really not a bad guy. When you live in New Liberty, known across the country as the City without a Super, there are only two kinds of people, after all: those who turn to crime and those who suffer. Michael and his adoptive father spend their days building boxes-special devices with mysterious abilities that they sell to the mob at a price. They provide for each other, they look out for each other, and they'd never betray each other. In New Liberty, a city torn apart by the divide between the rich and the poor, the moral and the immoral, this is as much of a family as anyone could ever hope for. But then a Super comes to town, a mysterious blue streak in the sky known only as the Comet, and Michael's world is thrown into disarray. The Comet could destroy everything Michael and his dad have built, the safe and secure life they've made for themselves in a city where safety and security are scarce. And now Michael and his father face a choice: to hold tight to their life, or to let it unravel. Michael Marion Magdalene Morn is a normal kid with one big secret. He can control people with his eyes! He lives in the lousy part of New Liberty, their town, in a place owned by a man named Tony Romano. The one person Michael told about his power is his friend Zach, aka Spike, who is called Spike because of the three inch spikes that he can shoot out of his skin. Zach tells his boss, Tony Romano, about Michael's superpower. Michael goes with the Romano clan to see Mickey "Six Fingers" Maloney. Tony and Mickey have a 'chat'. The 'chat' ended in conflict and Michael gets hurt. In the middle of the news the next day a villain appears on the screen of the TV. He will take over the town the next day. Michael tries to save the day by going to the villain's lair and stopping him. However, this does not work out and someone saves Michael. He leaves the scene and runs away. His next job is to save his father. 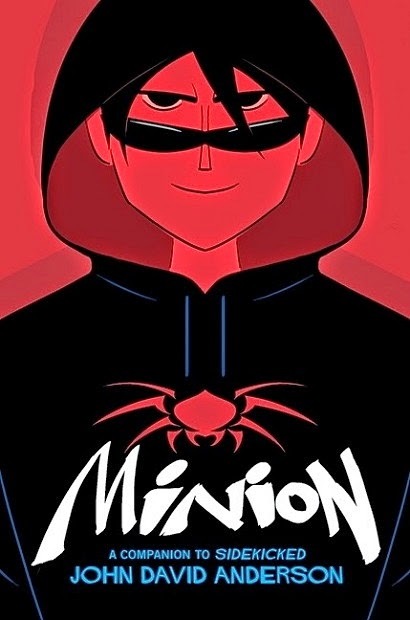 I immensely enjoyed Minion, it is a really awesome book because of all the action between characters. Here are a few of my favorite things about it. 1. All of the back story. Minion is a sequel but it is OK if you have not read Sidekicked because this book does a great job filling you in on what you missed. 2. The descriptions are good. Especially the wonderful descriptions of Michael's house, his dad, Zach and the villain's lair. 3. The many conflicts and fights were balanced out between other things. I thought Minion was a very good book and I hope you like it as much as I did. 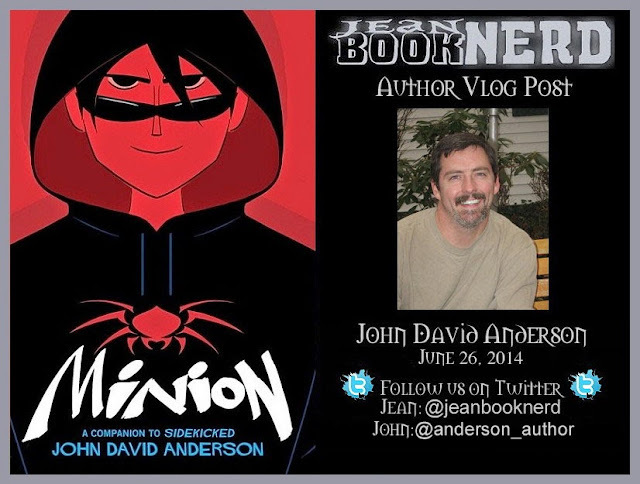 1 Winner will receive a Copy of Minion by John David Anderson.